The Spoked Traveller | I’m turning into a fly? I’m turning into a fly? 16 Sep I’m turning into a fly? I think I’m turning into a fly. Over the past few months, patches of scaly white skin is taking over my body. From a small coin sized patch on my right leg, it began growing into a large pancake size, then onto my left leg more red patchy skin. More scales. More skin. A few dots appeared on my left thigh– now, I have a full blown constellation on my leg. Cassiopeia? 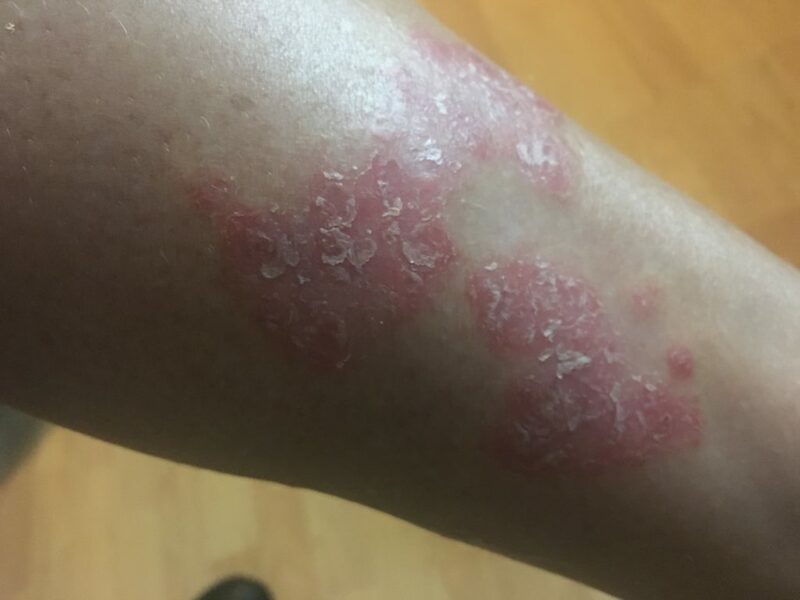 Apparently, psoriasis is genetic. I asked. No one in my family has it. I’m adopted? My body is overproducing skin cells. And since the scales flake-off in dime-sized patches, it brings new meaning to ‘give me some skin.’ I have loads to spare. It’s an autoimmune issue so it deals with my body’s ability to fight sickness etc. Anywho, the second symptom that exacerbates this is stress. Two things come to mind. New living arrangements (co-habitating with lovely P), and training almost everyday for a race that scares the crap out of me. Honestly, the training and race is on my mind–all the time. The rash wasn’t so bad. But then in the last month, it got to the point that people on the street were staring at my legs. This isn’t a big deal– I don’t care really, but if others are horrified or concerned that I’m turning into a fly, or creating a new layer of skin like a snake, then maybe I should start taking it more seriously, too? So, I’ve tried many things. First cortisone cream, but you can only use a steroid for up to seven days. Did nothing. Next, I went to a health food store and bought stupid expensive creams. Nada. Then, horror-upon-horror, while brushing me teeth one morning, I noticed a little scale of skin beside my eye. WHAT? This crap is now on my face? Then, I tried coal tar shampoo. Well, it stings like a b%$^^ and smells like tar, but it’s too soon to tell if it’s working. I asked for advice from family. “Melanie, this is stress related so look at your life. Or, look at something in your past life? Perhaps there is something that you didn’t deal with in another life.” Whoa. Hold the phone. Back up. Past life? Yikes. Next. I can’t deal with what’s in THIS life let alone go back rummaging through the last one. Gesh. Finally, I turned to expensive drugs. Dovobet is for the legs, and actually stings. So, for that reason, I had to buy another cream for my face, protopic. Price: $326. Yup, you read correctly. Do you realize what kind of shoes I could buy for that? So, moral of the story: chill out. OMMMMMMM. That’s me trying to meditate. Frig that, gimme the wine glass.